Manchester United legend Nemanja Vidic has claimed that none of Liverpool’s, Manchester City’s or Chelsea’s defenders would get into the Red Devils starting lineup. According to Manchester United’s official website, Vidic believes that the defenders of United’s rivals wouldn’t get into the Red Devils team ahead of the likes of; Phil Jones, Chris Smalling, Victor Lindelof and Eric Bailly. This is quite the claim considering that United have conceded the most goal (35) of teams in the top four and considering that Liverpool defender Virgil van Dijk has been one of the standout players of the season. Vidic was hugely successful during his time at United and he left behind a legacy as one of the best defenders to ever grace the Premier League. 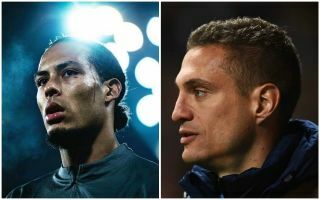 Former United captain Vidic will be hoping that he won’t have eat his words should Liverpool’s frightening attack tear apart United’s defence in today’s mammoth clash. The 37-year-old was very complimentary of Liverpool centre-back Van Dijk but the Serbian icon pointed to the idea that people shouldn’t get carried away with the Dutchman just yet. Fans can look forward to some more insight from Vidic, as he will be in the studio, covering the game for Sky Sports.